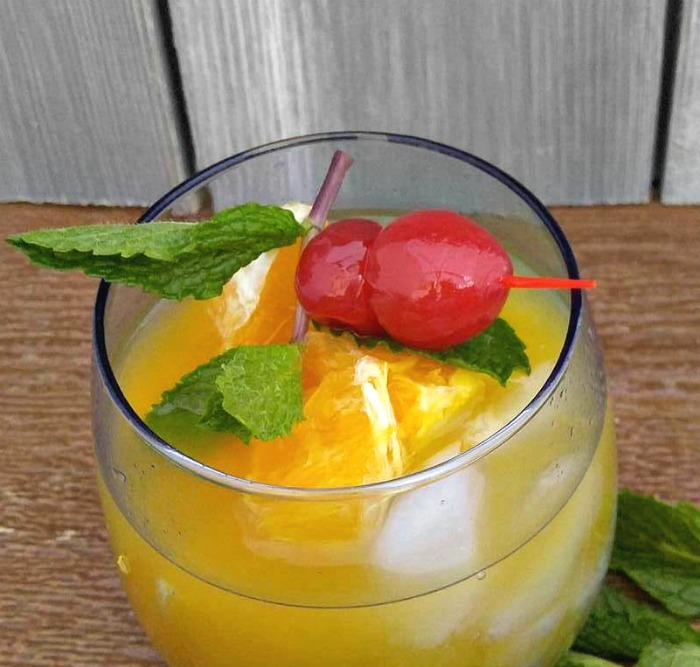 This orange cherry mocktail is a non-alcoholic drink that the whole family can enjoy. It is fresh and bright, and the perfect choice for those times that you are looking for a a pretty party time drink that contains no alcohol. After all, who doesn’t like the look of party drinks? There is no reason to save that look just for cocktails! I love cocktails just as much as the next person, but there are times when I just want the feel of a cocktail without the alcohol. Mocktails are the perfect choice for pregnant women, designated drivers or those dieting. And don’t forget the kids. They like pretty drinks as much as adults do. This Orange Cherry Mocktail has the party look and is a perfect virgin replacement for the popular screwdriver. Let’s Make an Orange Cherry Mocktail! Place some ice cubes into a cocktail shaker with a strainer and add 2 mint leaves, the orange juice, lemon juice and sugar. Shake well to make the mint leaves release their flavor into the drink. Place more ice into glasses and pour out the orange lemon mixture, being sure to strain the mint leaves out of the drink. You can use a high ball glass for a tall drink. Or a shorter snifter shaped glass to really get the look of the fruit showing. Cut the orange into small pieces and add it to the drink. Finally, top with two maraschino cherries on a toothpick and a sprig of fresh mint. Don’t forget to eat the fruit! Enjoy! The orange pieces (and cherries) make a nice sweet treat to eat when the drink is finished. 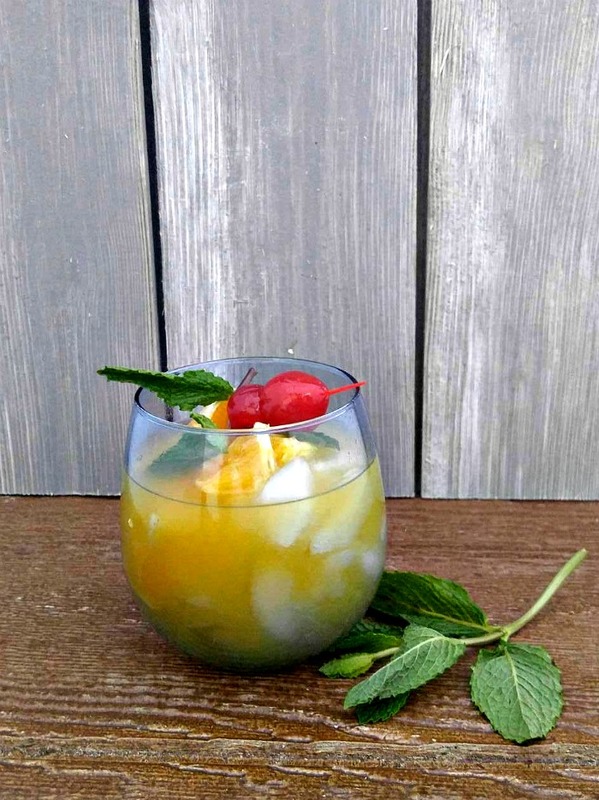 The mint adds a lovely flavor to the fruit, while making a nice ending to the mocktail. For more great non alcholic drinks, be sure to visit my Mocktail Board on Pinterest. This orange cherry mocktail is a non-alcoholic drink that the whole family can enjoy. It is fresh and bright, and the perfect choice for those times that you are looking for a a pretty party time drink that contains no alcohol. 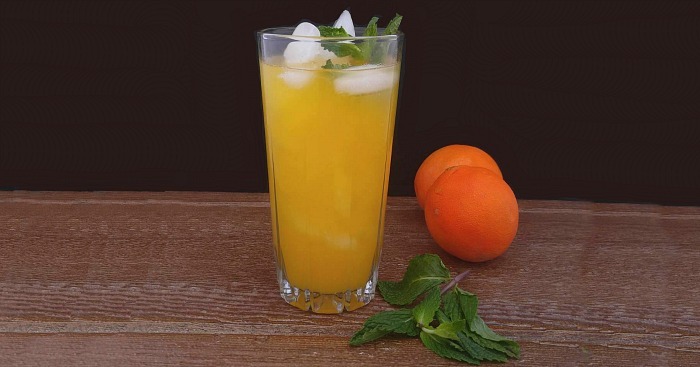 Place some ice cubes into a cocktail shaker and top them with 2 fresh mint leaves, the orange juice, lemon juice and sugar. Add the cut orange pieces to the top of the drink. Garnish with two maraschino cherries and a sprig of fresh mint.